Cedric couldn't really tell what he thought of the neutral lands. It had been something the boy had anticipated for a while, eventually being permitted to go and explore outside of Casa's territory at a price. He'd expected to see new sights, and he wasn't wrong, but nothing had that warm feeling, that sense of belonging, like the pack did. As the boy stepped further into the concrete ruins before him, he could feel the weight of Casa's scent being left behind. But not completely gone, for the smell of home lingered close by in the form of Isaac. He was the price, a responsible adult to go with Cedric whilst he got to go and see a place called Halifax. Honestly the young Stryder didn't understand why he couldn't go alone, Isaac was hardly responsible, if his rattling jokes and attempts to get the boy talking were anything to go by. Perhaps Cedric just felt a little jealous of the adult's physical strength compared to his own scrawny limbs, which were no doubt the reason he needed to be accompanied in the first place. "Something on your mind kid?" The butcher asked, "You've hardly said a word beyond a few grunts since we headed out." Cedric glanced back to see the man's concerned gaze, debating if he should give a reply or not. The boy didn't really know what he had against Isaac, probably nothing. But he simply didn't know the pack's butcher terribly well, and from what Cedric had seen, the older man just liked to joke around, and try and get Cedric to join in. "Yes, actually." Cedric mumbled, slowing his pace to match Isaac's, just so the other could see his frowning face as he spoke. "How did you get so strong? I don't see you doing much, so I don't understand how you get so tough, when I work hard to get stronger." For some reason Isaac found the question amusing, holding back a scoff underneath a slanted smirk. "Ah, that's an... interesting question. I suppose I just eat well, and do my job, there's no big method to it." The older man eyeballed Cedric as the boy's frown deepened in disappointment. "Why, you in some hurry to get strong? Don't worry Ced, it'll happen eventually. You've still got growing to do, so why not focus on some other things instead? Like, for example, what do you think we'll find in here?" Cedric looked around the collapsed buildings and cracked stone work, seeing nothing worthy of catching his golden eyes attention. "I didn't realise we were supposed to be looking for anything." The boy commented, a phantom pain in his shoulder spiking as he remembered the last time he'd explored inside some ruined buildings. The boy rubbed a hand along his leather shoulder pad, quickly pretending to check his armour and shield when Isaac looked to him. "Well I'm sure a lot of things have been taken already, who knows how many have scavenged around here throughout the years. But we might always find some hidden treasure stored away! Say, why don't you go check that street there? I'll search around this bit." Cedric looked a little stunned at the proposition to split up, but the little smile to Isaac's face as he offered felt like the adult was intentionally giving the boy some freedom. The corners of Cedric's lips lifted a little as he nodded, eagerly walking off to explore alone. The wonders of these tall structures, broken or standing, were a wonder to behold. Cedric had seen the handiwork of canine building, and he couldn't imagine why and how they could build things like this. But it then begged the question, if canines didn't make these, then who did? And what for exactly? The boy didn't think too long on it, as he spotted a way into one of the collapsed buildings. These structures seemed similar to the homes in the Fort, only all connected together and built taller. One particular one seem to have what looked like a turret, half caved in, that led into a light starved interior. The boy wondered if Isaac's words were true, as the idea of finding treasure was something even a more serious hearted child like Cedric could get behind. But as he stepped closer, apprehension caused Cedric's feet to stop in their tracks. The young Stryder didn't want another case like the collapsed church back in Casa, he didn't want to cause any problems that would prove he needed the help and security of an adult. Cedric could be independent and cautious all on his own, and so the boy stood his ground, peering into the dark building instead of venturing closer. The obsidian colored giant crouched like a beast in the shadows of a ruined building, nestled in darkness and the stench of decay that wafted around his matted coat as the giant wolf mix licked at the seeping and untreated wounds that riddled his front legs, claws kneading the ground and digging little rivets into the accumulated dirt and dust coating the once polished floors of the human building. The wold had been wandering aimlessly. His home had dissipated, burned to the ground, then they had built it all up from scratch once more, and once more his home vanished into thin air, once more the person that he loved had left him without a second thought. His family had dissolved, and his stability had taken a sharp turn. He had once been what could have been considered a good man, but now, there was little left to him, only the swirling darkness filled his mind and occupied his wretched damned soul. His days had gone by largely the same as of late, the demon would wander somewhere, he would cross paths with something or someone, and he would maim them, defile them, kill them, whatever it was he felt like doing that day or night, whenever it was he felt like doing it. He had become a creature of chaos, no thought, no instinct driving him, only a motive, to spread pain to those who did not truly know it. Who had not spent a night cradled in it's heated embrace. There was a sound a short ways off in the distance, a voice, and then another, a boy spoke of strength and a man answered back. Something within the demon of shadow stirred, a mere moment, before the hatred crashed over him once more like a wave of the ocean drowning out whatever vessel was unfortunate enough to be sailing it's deep dark waters. The drowning man stood, slowly, small dark patches clinging to the ground from where he had been resting, a mixture of his own blood, and that of the ones he had bled in his wanderings. The boy came to him, however, eager it seemed to know pain, to know darkness. Eager to grow up too fast or merely never to grow up at all. A dark tail lashed as the massive Secui sauntered forwards, joints aching and creaking, muscles stiffly propelling him forward at a casual pace. "Boy..." Came the voice from somewhere behind the silver Stryder, trickling from the maw of the beast like a black poison. "What is it that you seek?" He stood, he waited, if the boy should attack, Lux would strike him down, if he should run, the Secui would catch the bipedal wolf. He knew what it was he had set out to do. Something wasn't right about this place and it was only know beginning to dawn on Cedric as he peered into the depths of the decaying building. The dust here felt so... melancholy, so lonely. A strange feeling, but perhaps the boy was just so attached to his pack that it deluded his mind to what the world outside the place of warriors was like. Even the untouched buildings in Casa felt more alive, the dust that covered their walls and rotting wooden beams felt belonging, as if they were as much a part of the structure as the bricks that built it up. Out here in Halifax, beyond the protection of Casa, nothing felt in place. Cedric hoped not everything beyond his dearest pack was like this, otherwise his dreams as a pup were misplaced and disappointing. Cedric glanced around, sneezing as a sharp gust of wind blew some of the ageing dust into his face, wondering how far his 'guardian' had gone to give the boy his space. Hopefully venturing inside this crumbled turret wouldn't cause it to drop. As much as Cedric wises he wasn't, he was a light and lanky individual, provided he didn't slam into one of the main support beams or knock down a wall, he should be fine. The young Stryder was determined not to have Isaac fish him from a collapsed building, or hurt himself again like last time. So with tentative steps, the silver pup crept inside, moving as silent as possible as if mere words would cause stone to crumble. He crouched down amongst piles of chipped, moss-covered wood and pieces of shattered glass and searched for 'treasure'. Cedric knew not to expect to find anything gold like the colour of his eyes, but he was expecting at least something out of the ordinary. A book, something made of wood, or maybe even metal for Makoto to use in smithing as he'd mentioned once or twice during training. Trusting his canine senses, Cedric took a inquisitive smell of the moist air, and recoiled. Not from the layer of dust in the air, but the sudden and overwhelming smell of something horrid. The boy recognised the smell from the small cuts he received as a pup, or when his milk teeth were falling out, but never as strong as it smelt now. Blood, fresh and old. It would have made the boy gag if he didn't immediately switch into alert, snapping up to his feet when a voice crawled towards him from the streets. A shadow, it seemed, slivered towards him, stinking of blood and malice of the kind Cedric had never felt before. It made the fur's on Cedric's neck shiver, and he instinctively brought his shield closer to his chest. 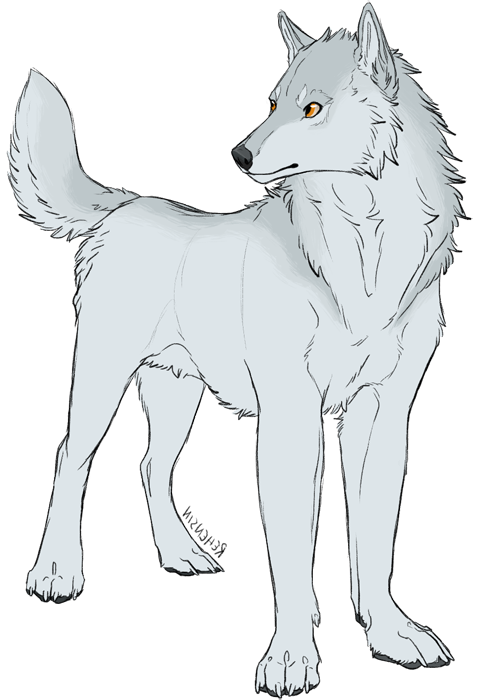 "I'm on unclaimed lands looking at what lies beyond my pack, is that a problem?" Perhaps the tightness to Cedric's throat made his words come out harsher then intended, but he made no attempt to correct them, and stood firm with his golden eyes frowning towards the dark stranger. The creature of darkness and nightmare had taken up a beastly existence, it ate away at his mind, corrupted and burned through the man that he used to be, until nothing remained but chaos, a tendency towards darkness, and urge to corrupt all the things that the light touched until nothing but darkness remained in them. As for those that the beast did not feel were receptive to his teachings? Those ones would be blessed, being made to sacrifice themselves to the darkness, so that it might grow stronger through the use of their life blood. A greyish tongue slid forward from his maw, lapping slowly at old blood and decay that clung to his lips and teeth like the stench of blood and death. He relished it, the scent of his conquests, the scent that made sure that everyone around him could tell that he was a threat. No problem... The beast uttered as the boy saw him, relishing the pale furred lad's reaction, savoring every second as the thin lad held his shield aloft as though it would save him from the monster. He dipped his head, hackles raising up slowly and deliberately along his spine, continuing forward. Little boys shouldn't wander alone, however. he remarked, a smirk gracing his demonic features as his one good eye looked up at the boy and shined like hellfire in a backdrop of blackness. A deep baritone growl rumbled up from within him then, the beast fully intending to teach this young male a lesson that he was most certainly not ready for. There was a sudden burst of life in the giants joints and he burst forward the rest of the way, one massive paw batting the shield out to the side with the strength of a bear as he stood taller, his head reaching to the boys chest even in this four legged unnatural beast form. You think this wood will protect you from me, boy? You think you're safe? He demanded, his baritone voice rumbling like thunder over the hills. The only thing keeping Cedric steady was his personality, his image of himself. He was determined to be fearless, so much so that it clouded that part of his mind that should focus on survival. Being afraid was like being weak, and Cedric hated that. It didn't help that the young Stryder hadn't met a single enemy in his life. He'd grown in the safe walls of Casa, he hadn't witnessed an attack, or been attacked before. It was all foreign to him, so the boy didn't know the appropriate way to act, so standing his ground against a foe that was unknowingly impossible to defeat was the only option. It would be the downfall Cedric wouldn't see coming, the lesson he didn't realise he needed to learn. "I'm not little," Cedric snapped in return, whiskers and fur bristling in irritation, the youngster too arrogant to hold back his sharp words, "so being alone isn't a problem." The boy neglected to mention anything about how he wasn't technically alone, Isaac was nearby amongst the ruins. But, this loner didn't need to know that, and for the sake of Cedric's independent image, he didn't want to admit that he was travelling with a glorified babysitter. Mistakes falling from his maw, Cedric felt prepared to brace and deflect the strike as the shadowy monster charged forwards. But the boy's lanky arms could have shattered under the impact of the blow, and his shield arm was knocked to the side as if it was merely a willowy branch in this black wolf's way. The monster sneered with yellowed teeth, rotten daggers that threatened Cedric with more words. There was a shudder down the boy's back, that natural instinct pulsing cold through his veins that told him to run and survive. But the brave child held it down. He had no sword, that had been left back home, but Cedric still had what nature provided him. The young child swung wildly forwards with his free hand, hoping to rake claws across the stranger's face that now snarled with a foul breath so close to Cedric's snout, before the boy jumped back and renewed his defensive stance. "I do. Because of the name I carry. This shield may not be much, but it is merely an extension of myself. One day I will be a shield for my family, but I can't do that with you in the way." The boy explained. He bared his clean white teeth, a grim comparison to the stranger's yellowed ones, and a dark example of how Cedric's exposure to the world was so very little. "Leave." In the face of doom, and the stench of blood, Cedric threatened the monster with a fierce and utterly inexperienced glare. The dark beast bellowed a laugh that seeped into the air like smoke from a flame as the young boy began to spout self righteous banter at him. The dark monster laughed in his face, and continued his advancement. "You seem awful confident, Boy... Tell me... Have you ever lost a battle? Have you ever... won a battle?" The haughty grin growing on his face was telling, in that he did not believe that the boy had much experience with the outside world. It was almost comical, almost sad, that the scrawny teenager armed with nothing but a piece of wood would stand his ground so confidently against the gnarled beast who's scent held with it the blood of many. Claws lashed out at the monster and the beast turned his head, shutting his eyes for half a second so that his remaining good eye would be unharmed, four small red lines blooming on Lux's cheek as he slowly righted his gaze and his smile morphed into something foreboding, and his snarl thundered around the room in which they stood. "You..." He spoke in a rumble as he once more continued his slow stalking deliberate approach, and he sneered at the words he was hearing. "Your name is nothing... Your name is a standard that you are far from reaching. You.. Are nothing." With an increase in speed, the monster intended to make it clear just how far the boy had yet to climb, he intended to push him and watch him fall before he would ever have the chance. Once more, the Secui bashed the scrawny boy's shield to the side, using the full brunt of his force as muscles bunched and contracted beneath his scarred hide, only this time, he didn't allow time for that recovery and retaliation, the monster in Secui reared up and roared in the face of the boy as he swiped massive claws at bare virgin skin, relishing the thought that perhaps he would be the first to mar such an unblemished being as this one. The first to show him the true nature of the world. Cedric's undying confidence and lack of fear was something never addressed, not well enough to stick in the boy's head. He'd tried to swim in a freezing river when his fur was barely thick enough to tackle the harsh winter winds, and he'd done so without fear. He'd pulled himself and his milk sister out of a collapsed building after shifting for the first time moments earlier, without a thread of doubt. That unruly bravery had existed in Cedric for as long as he could remember, it was what spurred on his protective nature, his determination to be a perfect knight, and his unbreaking stubbornness. But it also brought with it a terrible danger. Cedric had yet to experience a time where he'd need to step in and help one of his family, but he'd imagined doing so when dreaming of his future. Fighting for Casa meant being it's shield, and Cedric felt willing to do whatever it took to stop others from getting hurt. Stopping himself from being harmed never came into the equation as far as the hopeful Stryder was concerned. There was only one other thing that kept Cedric so blind the idea of fear. He'd never been in a fight before. There was an illusion of skill created by his time nursed by his fellow Cavaliers, that made Cedric feel strong and feel a part of a warrior pack. He had nothing to compare the might of a Casa Knight to, so he'd naturally assumed there was nothing out there as strong as them. And, following that theory, being a young Cavalier, Cedric considered himself well off in terms of fighting prowess. But it wasn't until his shield was battered to the side for a second time, definitely leaving bruising along the shield arm, and the monster was yet again in his face snapping with blood-soaked teeth that Cedric realised how wrong he was. Giant claws came lunging towards him through the dark interior of the room and Cedric was too slow to move back once more. Sharp, natural weapons met flesh as the claws shredded down the side of the boy's face, barely missing his precious throat before ending their swipe across the front of his chest. Cedric had felt pain. His shoulder had been snapped out of place in the church collapse back home, but even the jolt of having a bone popped back into a joint was nothing compared to the cold chill and bone deep pain following the attack. A cry fell out of Cedric's maw, quickly closed off as Cedric forced his mouth shut, slamming down on the pain as hard as his jaws snapped together. It was agony, oh it burned and stung like nothing Cedric had felt before. But, he couldn't let it break him. A monster still stood before him, one that could strike again and again until the one pure snowy boy was nothing but crimson ribbons. Cedric needed to do something. Cedric glared back at the beast, his eyes fearful for a moment before snapping back into focus. He couldn't be scared, he was a Stryder, and no one baring that name would bow down after a single blow. The boy rushed out of immediate range of the shadow's claws, raising his shield and trying to search for a good exit. Cedric wouldn't win this fight, he knew that. He had a shield and thin, pale claws that would barely scratch the surface of his foe's massive body. Isaac however, was armed. As much as Cedric didn't want to admit it, he'd need the adult's help. So it was a matter of getting past the monster, out of the tight space in the room to rush outside and hope he could get close enough to gather the Cavalier's attention. "I may not be much," Cedric growled, half snarling and half wincing from the pulsing pain just under his right eye, "but I'm much more than you are, monster." The boy heckled, holding his position and hoping to goad the beast into an attack, planning to dodge passed and out into the streets at the same moment. The demon beast of pitch and coal gained a sick satisfaction from teaching this skinny pale boy, so full of haughty pride, about the horrors that life truly possessed. His flagged up and bristled tail wagged at the notion that he would be the bearer of that lesson for him, selflessly dishing out wisdom to the pitiful souls that called this plane of existence their home. Yes, he would teach them all that same lesson. What point was there in living, save to push others along that merry path to the other side? To put the sorrowful ones out of their misery, to put the haughty ones in their place. Blood and strands of stinking saliva dripped from his darkly grinning maw, everything about him pushing up and forward as he loomed ever towrds him. The beast had bashed the young Stryder's shield away a second time before he would rake obsidion daggers down the unmarred face and chest, a dark laugh echoing through the building as he heard the boy's cut off cry of agony. A single golden eye sparked maliciously as he saw the boy hurriedly pull away and raise his shield once more. He saw fear cast within the boy's brown orbs, before he would rain that fear back under his tentative control. "It would seem I underestimaded your resolve." The goliath Secui allowed, his grin only spreading as he realized that his newest toy wouldn't give in without a fight like the other Cavalier he had encountered the year prior. Stalking towards him again, the wolf lept with his full weight, only for massive paws to smash against the stone ground as the smaller boy darted past, and the demon roared, turning and twisting his massive frame around to chase the boy out of the building, hot on his heels and snapping forcefully, before it became aparent that someone else was there, a man, armed, ran out of the woodwork towards them, and the demon's thirst for blood only grew. Cedric didn't know what caused evil. The concept of it was hard to accept in a place like Casa, that was so full of lawful and good individuals. The boy had been well loved there, cherished and brought up in a world that only knew of kindness and respect. Truly, it made Cedric blessed. But it also made him blind. Even now as warm blood trickled down from the gashes across his face, Cedric didn't understand what caused such evil. He couldn't comprehend what had caused this dark shadow of a man to attack him, bleed him and,if the smell of decay on his fur was anything to go by, finally kill him. All the boy knew what that this wasn't like the canines he knew, this was the actions of a monster. There would be no reasoning with them, Cedric could only hope to escape and live through the encounter. Claws crashed down behind Cedric as the monster attacked the space the boy had just moved away from, and he didn't look back as he raced out of the building and into the dead city of Halifax. Stones skidded across the cracked and ancient concrete as Cedric ran, feeling the hot air expelling from the lungs of the beast that chased him and snapped at his heels. Remembering where he and Isaac had split up, Cedric turned the corner and heading for the spot, feeling a hint of relief when he saw the blue and brown coat of the guardian just ahead. Isaac turned at the commotion, lifting an axe in one hand, just as Cedric felt the impact of sharp and heavy claws hit his shoulders. The weight of the claws now cutting into the boy's shoulders sent him forwards into a tumble. Cedric had just enough time to move his shield and take most of the fall against the wooden defence instead of feeling the cold and rough ground against his skin, but not enough to stop himself from actually crashing to the ground. The boy looked up and over to Isaac as the adult pulled a knife from his belt and threw it towards the great shadow, before standing ready with an axe. "Whatever your motives are I suggest you leave. This city borders our pack, it would not take them long to arrive and for your situation to become plenty more dire. Do the smart thing and leave the boy alone." Isaac growled, that joker demeanour gone from the adult and replaced with a fierce glare. The dark demon roared his rage when curved talons hit barren concrete rather than flesh, and he wheeled, his massive form struggling to turn on a dime as he scrabbled out after the fleet-footed Stryder boy. Bloodied and putrid smelling jaws snapped at him as his claws left little specks of the boy's blood in his wake. It was with a massive leap and powerful contraction of hind legs that the dark assailant lunged and raked claws comparable to those of a bear into the pale boy's shoulders. And his prey went tumbling down, the dark male coming to stand over him, massive paws pressing into the road on either side of that scrawny body, though his eyes darted up to meet the knight standing before them. "This one looks... more of a fight." The pitch black demon rumbled, licking his chops as he tensed his claws against the ground, but lept to the side as he saw the other man produce a knife and throw it, the dark beast moving away. He was a predator in the most primordial sense of the word, but even predators possessed a sense of self-preservation and would move away from the kill if it meant saving their own hide. A chilled laugh tumbled from the demon's bloodied maw as the other man spoke his piece. "There are no sent markers here to claim this town... Cavalier... Neutral territory..." He hissed on a husky breath, muscles rolling as he walked slowly around in a semi-circle, eyes never leaving the armed soldier of Casa.